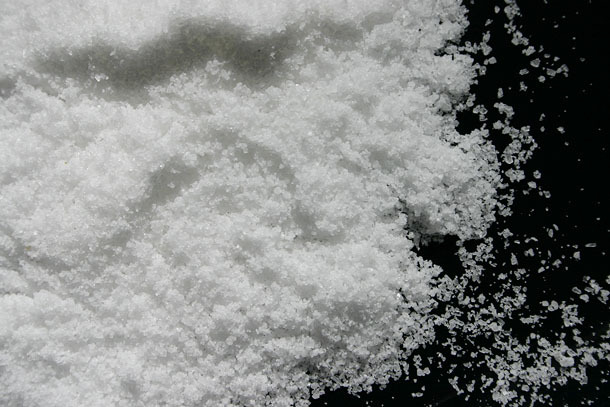 Salt is the subject of much controversy at the moment. Excess salt, or sodium, in the diet can contribute to high blood pressure in susceptible people. Some medical experts believe that everyone should cut down, as it is not always possible to know who these susceptible people are. Other scientists feel that general reduction is not the answer saying only those with known high blood pressure should cut down. What is known is that our sodium intake is still far too high. Much of this is due to the amount of it in various forms added to manufactured foods. Just because a food does not taste salty does not mean that salt has not been added! Adding more during cooking or at the table further increases the total amount. it is a good idea to be aware of the foods containing sodium, and to limit them if you find you regularly consume them. Sodium in various forms is often added to processed foods during manufacture. Your taste buds will adjust if you cut down adding salt to your food gradually. After a couple of weeks you will be able to remove the salt pot from the table...and the kitchen. Try using lemon juice, fresh or dried herbs or spices to flavour food rather than salt. Vegetables taste much better when cooked without salt, indeed salt can damage the delicate vitamin content that they possess. Table sauces are usually very high in salt, even organic ones, so try using chilli sauces at the table and in cooking, as you will need a great deal less. Use unprocessed oats, rye flakes and dried fruits to create your own unsalted muesli and omit nuts to lower the salt content. Natural unprocessed oatmeal and porridge oats contain a lot less salt than commercially prepared breakfast cereals and taste just as delicious.